Speaking to Wired in a new interview segment published today, Skyrim director Todd Howard revealed that the game will feature randomly generated quests created by its Artificial Intelligence "director," known as Radiant Story. Howard mentions that after finishing the written "story" quests for factions like the Dark Brotherhood (made up of assassins) and The Thieves Guild (made up of thieves), players will continue to recieve randomly generated quests. Theoretically, different quests will be generated... forever. While I can imagine that most of the random quests will amount to "Go to that house and kill that guy," that is still very cool news about Skyrim. We already know that Bethesda's games feel infinite, and this one pretty much will be. But it also got me thinking about randomness, and what makes a game feel vital and immersive. Sometimes, a randomly generated world can feel more alive than an authored one. Can Skyrim ever feel as alive and real as Minecraft? Howard has spoken before about how Skyrim will use far fewer procedurally generated environments than its predecessor Oblivion. Procedurally generated environments are random—the game's software takes pre-designed assets like trees, grass and hills and scatters them out according to a pattern dictated by the game's programmers. It was something I'd notice a lot in Oblivion: here is another forest, much like the four I just visited, but laid out slightly differently. But even in screenshots and demos of Skyrim, it's clear that most of the environments have been deliberately laid out by artists. Each landscape, each dungeon, each mountaintop looks unique, imbued with life by a specific human being. This got me thinking about Minecraft. Notch's randomly generated infinite worlds have always felt remarkably real to me, not in spite of their randomness but because of it. Each time I make a new world, it's truly unique, and that gives it a sort of vitalness absent from the authored worlds like Grand Theft Auto and any of the Elder Scrolls games. After all, the real world is procedurally generated. The procedures are incredibly complicated—we call them "Science"—but the same principle applies. When unbelievable or beautiful things happen in the real world, they're all the more moving because they happened amid the chaos of an infinite universe. Never forget what Eric Idle told Mrs. Brown about the universe. Remember its infinite randomness, and your life won't seem so empty and boring. And so it is in Minecraft—when I happen across a beautiful rock formation or a particularly rich vein of minerals, I feel I owe my thanks to something more profound than just the game's creator. I know that sounds a little silly. But don't you know what I mean? In a very real way, the universe itself has conspired to make that rock stack on that pile of dirt above that body of water, or at least, to make the zeroes and ones align in such a lovely way. How tiny are we in the face of an infinite, random universe? And therefore how special and significant is this thing in front of us, which shares the same improbable space? It's that sense of mystery that most draws me to Minecraft—the fact that I'm imposing my will on a landscape that already has a will of its own. It's the same thing that motivated the the brilliant game developer Jason Rohrer to make that super-cool "Chain-World" Minecraft-metagame of his feel so vital. Back when I interviewed him about it for a feature at Paste, he told me, "I think that the gameplay [of Minecraft] is in its own way very compelling and addicting, but in between the periods of compulsion, there are these incredible moments, like the first time you dig down to the bedrock and then look back up... and you see the vanishing point. You realize how deep you are, and how far down you've come, and how huge this world is. How small it makes you feel." That perfectly encapsulates the paradoxical significance that randomly generated worlds can have. How tiny are we in the face of an infinite, random universe? And therefore how special and significant is this thing in front of us, which shares the same improbable space? 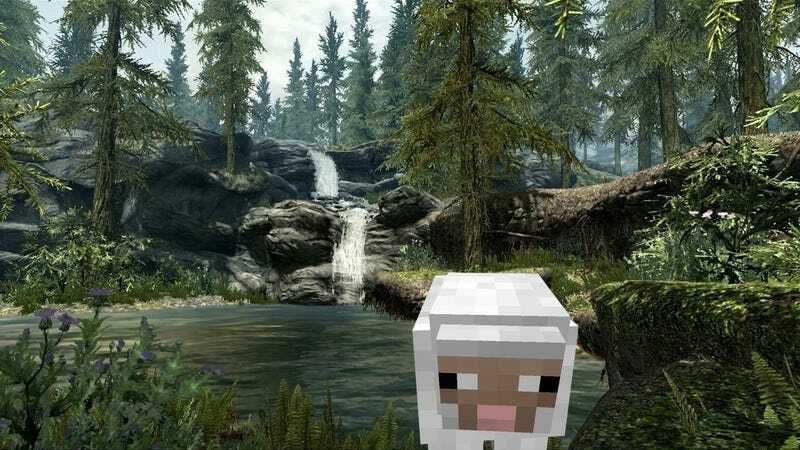 Of course, Skyrim's random quests most likely aren't in the same league as Minecraft's random worlds, but the fact that Bethesda is experimenting with procedural content has me excited. I like to make my way through an authored experience as much as the next guy, but I'm finding that I love the vitality of randomness just as much. I don't know if Bethesda will realize the dream of true procedural content in Skyrim, but on the day that they hit the middle ground between careful composition and digital improvisation, their games truly will become infinite. I find myself very much looking forward to that. (Image credit goes to Fahey, as much as I'd love to take credit for another awesome skyrim 'shop.